After taking on some of the most dangerous roads in the world through the Himalaya Mountain Range of India and Nepal, I acquired a great fondness of extreme and dangerous roads. There is a feeling you get when you are sitting in a Jeep that is rocking and rolling on uneven road, tilting towards unforgiving cliffs and speeding through waterfalls, for most people is nausea and a headache, but with the right attitude it can be better than a roller-coaster. In the Taihang Mountains of Hunan Province, China lies the interesting and frightening Guoliang Tunnel. The road was built by people in remote villages that wanted to connect themselves to civilization. It took five years to finish the 3/4 of a mile long tunnel along side the cliff. The tunnel has many windows and openings that give great views to the surrounding mountains and precipice below. Want to visit: Well its a little tricky, but not impossible. Supposedly the road is closed for tourists but if you are ok being sneaky and paying the price a bus can take you to the Wanxianshan Scenic Area where you can hike the tunnel to Guoliang. Here you can embark on other impressive treks in the area. 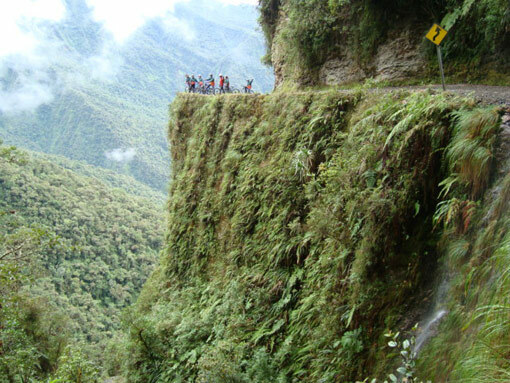 After coming back from South America, I was able to meet many people who successfully mountain biked North Yungas Road also known as Road of Death in Bolivia. This road takes kills 200-300 travelers yearly. Its 40 mile downhill stretch attracts thrill enthusiasts from all over the world.How much does it cost? Well you can find tours for as little as 400 Boliviano or $57, but make sure to check the bikes. Camino del Rey, Spain is not really a driving road, but a cliff suspended on the side of a cliff. Its so dangerous that you must use a harness and clip onto guide cables as you climb. This trail was once used to transport materials to a hydro electric plant, it has now fallen into disrepair but that makes it so much more thrilling. With parts of the trail missing you are suspended over thousand foot drops and have to traverse small sections. Closed or open? different sources say different things. It is said that there are security guards at the entrance, but it is also said that they are not there to stop you if you so choose to walk. The bottom line is do use a harness and don't go alone.